We’d love your help. Let us know what’s wrong with this preview of The History of the Siege of Lisbon by José Saramago. "If proofreaders were given their freedom and did not have their hands and feet tied by a mass of prohibitions more binding than the penal code, they would soon transform the face of the world, establish the kingdom of universal happiness, giving drink to the thirsty, food to the famished, peace to those who live in turmoil, joy to the sorrowful ... for they would be able "If proofreaders were given their freedom and did not have their hands and feet tied by a mass of prohibitions more binding than the penal code, they would soon transform the face of the world, establish the kingdom of universal happiness, giving drink to the thirsty, food to the famished, peace to those who live in turmoil, joy to the sorrowful ... for they would be able to do all these things simply by changing the words ..." The power of the word is evident in Portuguese author José Saramago's novel, The History of the Siege of Lisbon. His protagonist, a proofreader named Raimundo Silva, adds a key word to a history of Portugal and thus rewrites not only the past, but also his own life. Brilliantly translated from the Portuguese by Giovanni Pontiero, The History of the Siege of Lisbon is a meditation on the differences between historiography, historical fiction, and "stories inserted into history." 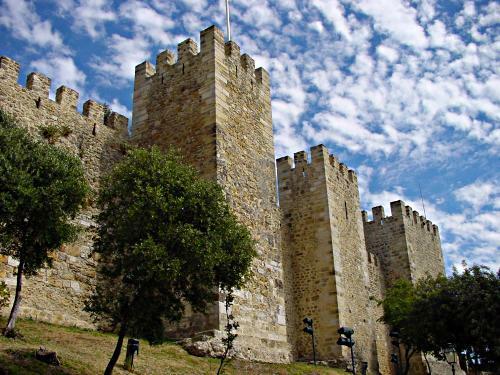 The novel is really two stories in one: the reimagined history of the 1147 siege of Lisbon that Raimundo feels compelled to write and the story of Raimundo's life, including his unexpected love affair with the editor, Maria Sara. In Saramago's masterful hands, the strands of this complex tale weave together to create a satisfying whole. To ask other readers questions about The History of the Siege of Lisbon, please sign up. I'd like to read the book online, how? Stefania Lazar You can find a Kindle edition on Amazon. Jose Saramago may not somebody who relies so heavily on plot. He utilizes stream-of-consciousness in "The History of the Siege of Lisbon" as a way to merge the history of the city’s past with that of the protagonist living out his life in the modern day. In the novel, conversations bear no quotations, no parentheses appear on added-on ideas/non sequiturs, nor are questions accompanied by a ?. Whole paragraphs are pages long, & it's safe to say that most of them contain a single action or nou Jose Saramago may not somebody who relies so heavily on plot. He utilizes stream-of-consciousness in "The History of the Siege of Lisbon" as a way to merge the history of the city’s past with that of the protagonist living out his life in the modern day. In the novel, conversations bear no quotations, no parentheses appear on added-on ideas/non sequiturs, nor are questions accompanied by a ?. Whole paragraphs are pages long, & it's safe to say that most of them contain a single action or noun which is then fully explored for the remainder of that paragraph: each minutiae is meticulously explained and more questions (plenty of the hypothetical kind) are added on to the subject in question. Also a heavy use of commas and lists is a way of penetrating truths in a deeper way. He's NOT MY KIND OF WRITER: he asks way too much of his readers, & one wonders what would happen if Saramago had SOMETHING going on, namely a STORY, & if he added all the flourishes that make him unique: THAT would truly grab me. مع ساراماغو أكون قد قرأت مئة كتاب لهذا العام، وأنجزت التحدي القرائي لـ 2014، طبعاً لا يعني هذا أنني سأجلس بلا قراءات فيما بقي من العام، بالعكس الرقم مرشح للزيادة، لأن القراءة بالنسبة لي ليست تحدياً سنوياً وإنما هي ممارسة يومية، تملأ روحي وقلبي وعقلي بهجة ولذة. اخترت ساراماغو لأني أردت ختاماً يليق بعام قرائي حافل ومثير، قرأت فيه عناوين كانت تنتظر منذ زمن، ولم يخيبني النوبلي البرتغالي، فقدم رواية يمتزج فيها التاريخ – سقوط لشبونة بيد البرتغاليين وتأسيس البرتغال بعد طرد المسلمين منها - بالواقع - من خلال مصحح يعمل على مخطوطة تتحدث عن حصار لشبونة يقرر أن يعيد كتابة التاريخ انطلاقاً من تغيير طفيف، كلمة واحدة - وكذلك بالحب - من خلال علاقة المصحح بامرأة يتعرف عليها وتنمو علاقتهما سريعاً -. الرواية رغم أسلوب ساراماغو المميز وطريقته المرهقة في الكتابة، إلا أنها تبدو مختلفة نوعاً ما، مختلفة عن ما قرأته لساراماغو حتى الآن، ففي حين تتشابه العمى والطوف الحجري، تبدو هذه الرواية أقرب لرواية (كل الأسماء). The History of the Siege of Lisbon is a novel by Portuguese author José Saramago, first published in 1989. Raimundo Silva, assigned to correct a book entitled "The History of Siege of Lisbon" by his publishing house, decides to alter the meaning of a crucial sentence by inserting the word "not" in the text, so that the book now claims that the Crusaders did not come to the aid of the Portuguese king in taking Lisbon from the Moors. This has repercussions both for himself and for the historical profession. The second plot is Saramago's simultaneous recounting of the siege in the style of a historical romance. Encontrei na escrita o cunho de Saramago, mas não a superioridade habitual das personagens. Escrito em dois planos temporais perfeitamente interligados, o livro reescreve a história do cerco de Lisboa e, simultaneamente, dá-nos a conhecer as personagens atuais num enredo que mistura História e ficção. Sem grande força ou carisma e com um desenrolar calculável, reinventa um novo cerco para um mesmo desfecho. Ainda assim, vale sempre a pena ler Saramago e admirar a sua arte de escrever como quem con Encontrei na escrita o cunho de Saramago, mas não a superioridade habitual das personagens. In the glowing light of the day and in the rosy spirit of the present calendar week (romance in the air...) I am overwhelmed with positive emotions and declare my ever-growing admiration and respect towards the great Portuguese writer José Saramago (1922-2010) and his golden legacy in terms of his well-known controversial, challenging, and thought-provoking novels. I am completely and irrevocably absorbed into his works. I am jumping like a mosquito from one book to another, in a very ambitious In the glowing light of the day and in the rosy spirit of the present calendar week (romance in the air...) I am overwhelmed with positive emotions and declare my ever-growing admiration and respect towards the great Portuguese writer José Saramago (1922-2010) and his golden legacy in terms of his well-known controversial, challenging, and thought-provoking novels. I am completely and irrevocably absorbed into his works. I am jumping like a mosquito from one book to another, in a very ambitious attempt to read as much as possible, but of course I am not able to because I feel I am not grasping as much as I need in this frenzy and hectic pace, so I take one step or even two back and start anew. But, skipping over this (there is no need to leverage our satisfaction based on pecuniary ground), I am glad to acknowledge that I have thoroughly liked and loved the main male character Raimundo Benvindo Silva. In the serie of books I've read so far (luckily it seems I followed intuitively a perfect sequence, starting with Baltasar and Blimunda and then The Year of the Death of Ricardo Reis), this is number 3 novel actor, and it has had an extensively positive impact over me. Could be due to number 3 magic properties. I relish 3 and any multiples of it, including number 7. And from here on-wards I give the word to the great voice of Saramago, this being a block of text that I have had lots of fun reading it 😊😊😊 reminding me of myself. ≪ …Raimundo Silva must have whispered a similar plea [may God protect all of us, for we are fighting in His name], transposed into the first person singular, as he set about dialing the number of his destiny, but in a whisper so low that it scarcely passed his lips, a plea as tremulous as that of any adolescent, he himself now has more food for thought, if he thinks, whether his body is not simply one huge kettledrum where the bell of the telephone rings and rings, not the bell, the electronic signal, awaiting the sudden interruption of the call, and a voice that says, Speaking, or, What can I do for you, perhaps Hello, perhaps Who’s calling, there is no lack of possibilities amongst the conventional phrase and their modern variants, however, dazed as he was, Raimundo Silva was unable to hear what was being said, only that it was a woman speaking, so he asked disregarding any niceties, Is that Dr Maria Sara, no, it was not, Who’s speaking, it was as if Raimundo Silva wanted to know his editor’s voice, this was not a truth beyond question, but served as a simple form of identification, we are certainly not going to suggest that he introduced himself as Raimundo Benvindo Silva, proof-reader, working for the same publishing house, and even if he had, the reply would have been the same, Wait a moment, please, I’ll see if Dr Maria Sara can take your call, never had a moment been so brief, Don’t ring off, I’m carrying the telephone through, then silence. And how often, copying original texts in their scriptoriums, did monastic scribes change them to their own liking or adjust them according to the current beliefs and religious fashions? José Saramago wrote this novel also to illustrate such complex and nonlinear causality. 5 αστέρια, εις ανάμνησιν! Γιατί οι μεγάλες αγάπες ΔΕΝ ξεχνιούνται! هذا القفل الأدبي المحكم كله ثقة بأن الرواية المريحة لا تستحق عناء قرائتها!.. انطلاقًا من عنوان الرواية تجد إزدواجية التركيب ( قصة ( مركب تخييلي ) حصار لشبونه ( مركب تاريخي ) ) بذلك يتجلى مكر ساراماغو بهذا المزيج الذي يحاصر القارئ .. ساراماغو هذا الشيخ يحاور شيخًا آخر أدهى منه / التاريخ / بل ويساومه على بعض حقائقه بإفتراضاته المتشعبة المبتغيات ، محاورة جادة للغاية و المحاورة بين شيخين فن عتيق .. ناتجهُ لا يطوى ولا يروى كما يُقال .. فالأمر شخصي للغاية بينهما..
أثناء تصحيح رواية تاريخية لمؤلف تقليدي لا يحيد عن الإرث التاريخي قيد أنملة ، و بغية تجهيز الرواية التاريخية للنشر نجد المصحح -المحب لعمله - رايمندو سيلبا يضيق ذرعاً ب نعم التي تثبت المساعدة الصليبية للجيوش البرتغالية في حصار لشبونه في عهد الملك البرتغالي أفونسو ، فيقرر استبدالها بلا و كشط زيف لا يتقبله منطقه ! هذا العمل الجريء يجعل مهنته في مهب الريح حيث تقرر دار النشر - ممتنة لخدماته الجليلة - منحه فرصة أخرى تحت إشراف السيدة ماريا سارة ، التي سوف تشجعه على التمسك ب لا كحق مواطن بمقدوره السباحة ضد التيار و إن كان التيار سيجرفه في النهاية ، لا بأس بشرف المحاولة .. تبدأ الرواية التي سيكتبها رايمندو وبتشجيع من ماريا سارة ب- الفجر السّلمي الأخير و المؤذن يرفع صوته باطمئنان مناديًا لصلاة الفجر وتنتهي روايته ب فجر عبثي تُحزّ فيه رقبة المؤذن قبل إطلاق صوته المدوي بالإذان - و الفجر في الحالتين يرمز للوضوح و الخلود رغم غفلة التاريخ لهذا . لنقل أن ساراماغو غيّر تفاصيل اللعبة وترك الأمور في نصابها في نهاية المطاف . أحببت الرواية بعمق ، ف ثيماتها مغرية و سردها المشوش والمحفز مغر.. و تقنياتها مدمرة . Mais uma vez, acabo um livro de Saramago com uma sensação quente no peito, e a vontade de ignorar a minha lista de livros a ler e ir imediatamente comprar outro livro do Nobel português. História do Cerco de Lisboa conta a história de Raimundo Silva, um revisor literário, que Saramago descreve como "solitário, simples". Como revisor, Raimundo limita-se a corrigir os erros de autores, sem qualquer liberdade artística, dado que é o campeão da realidade num mar de inconsistentes obras literárias. Até que um dia Raimundo, homem de costumes e rotinas, ao rever um livro académico sobre o cerco levado a cabo por D. Afonso Henriques contra a cidade mourisca de Lisboa, decide mudar a História ao escrever que os cruzados estrangeiros 'Não' aceitaram ajudar na conquista da cidade. Este seu desvaneio tem como consequência a contratação de Maria Sara, a sua nova supervisora. Se tivesse de dar um moral a este livro seria carpe diem: se Raimundo não agisse por impulso, se não tivesse escrito um 'não', não conheceria Maria Sara. Esta não o desafiaria a escrever a história do falso cerco, e ele não descobriria que em si existe mais do que ele é.
Vive agora em dois mundos, o da Lisboa mourisca do século XII e a Lisboa presente, reflexos pouco nítidos uma da outra: no presente, Raimundo sente-se confuso em relação a Maria Sara; mas no passado, Mogueime ferve pela barregã Ouroana, que pertence a um nobre estrangeiro e portanto nunca será sua. Raimundo explora, sem saber, o seu subconsciente desejo por Maria Sara através destes improváveis amantes. Até que finalmente, após diversos encontros carregados de tensão amorosa, Raimundo e Maria Sara admitem como se sentem, e o revisor, que tanto se debatia sobre como era o amor medieval, acaba por fazer Mogueime conhecer Ouroana da mesma maneira que conheceu Maria Sara, como te chamas, eu sou Raimundo, ou eu sou Mogueime, não há diferença entre os dois, que ambos querem acabar o cerco e destruir as muralhas, um as da cidade de Lisboa, o outro as suas próprias muralhas e as de Maria Sara. While typing up my brief review of One-Hundred Years of Solitude, i was reminded of this book, one of my favorites of all time, because like Gabriel García Márquez's book, this was beautifully written as well as an awe-inspiring translation effort. For 15 years i was an editor of reference books. It shouldn't be a surprise, then, that a professional proofreader protagonist/narrator immediately compelled me and held my attention. The idiosyncratically minimalist punctuation and the pages-long comm While typing up my brief review of One-Hundred Years of Solitude, i was reminded of this book, one of my favorites of all time, because like Gabriel García Márquez's book, this was beautifully written as well as an awe-inspiring translation effort. For 15 years i was an editor of reference books. It shouldn't be a surprise, then, that a professional proofreader protagonist/narrator immediately compelled me and held my attention. The idiosyncratically minimalist punctuation and the pages-long comma-spliced sentences were so unbelievably perfect for me as a reader (and for this story) that i couldn't put it down despite the difficulties they presented for comprehension. Saramago was forcing me to read more carefully than when i was attempting to consume the entire science fiction canon in the mid-1990s. من أعلى القلعة هبط لأول مرة نهائيا وإلى الأبد، الهلال الإسلامي وإلى جواره الصليب الذي يعلن للعالم التعميد المقدس للمدينة المسيحية الجديدة، ارتفعت ببطء في زرقة الفضاء يقبلها الضوء ويحركها النسيم خفاقة بكبرياء النصر راية ملك البرتغال الذي استولى على لشبونة من أيدي المسلمين "دون أفونسو هنريكس" وعليها شجر الكينا، وهو يصدح: لا تفرقوا بين عمر وجنس، اقتلوا الطفل الرضيع والشيخ الهرم والشابة اليافعة والعجوز الفانية. إنها قصة حصار لشبونة البرتغالية، واستسلام المسلمين من جراء الجوع، فهم في نظرهم ليسوا أهلا من أعلى القلعة هبط لأول مرة نهائيا وإلى الأبد، الهلال الإسلامي وإلى جواره الصليب الذي يعلن للعالم التعميد المقدس للمدينة المسيحية الجديدة، ارتفعت ببطء في زرقة الفضاء يقبلها الضوء ويحركها النسيم خفاقة بكبرياء النصر راية ملك البرتغال الذي استولى على لشبونة من أيدي المسلمين "دون أفونسو هنريكس" وعليها شجر الكينا، وهو يصدح: لا تفرقوا بين عمر وجنس، اقتلوا الطفل الرضيع والشيخ الهرم والشابة اليافعة والعجوز الفانية. إنها قصة حصار لشبونة البرتغالية، واستسلام المسلمين من جراء الجوع، فهم في نظرهم ليسوا أهلا للشفقة حين عرضوا عليهم الانسحاب في سلام ومعهم أمتعتهم وثرواتهم، فالدم في نظرهم هو الذي يستطيع غسل أسوار لشبونة من الدنس الذي ظل يلوثها أكثر من ثلاثمائة وخمسون عاماً، واعادتها طاهرة نقية للمسيح بمساعدة الفرنسيين والنورمانديين لهم. في الخط الآخر من الرواية قصة حُب نشأت بين المصحح "رايموندو سيلبا" والمدير الأدبي لدار النشر السيدة "ماريا سارة"، ومزجها بين قصة الحصار وتفاصيل حياتهم. The book is over 300 pages long, contains about 75 paragraphs and only one period per paragraph. Typical of Saramago, and in my opinion, very entertaining. He begins with the story of a rather mediocre proofreader who gets annoyed with the over-confident author of a trade history book (hey, I had one of those on my dissertation committee! Just awful). So the proofreader deletes a "not" from a key passage. The dustjacket claims that this changes the course of history, but Saramago is not a Star T The book is over 300 pages long, contains about 75 paragraphs and only one period per paragraph. Typical of Saramago, and in my opinion, very entertaining. He begins with the story of a rather mediocre proofreader who gets annoyed with the over-confident author of a trade history book (hey, I had one of those on my dissertation committee! Just awful). So the proofreader deletes a "not" from a key passage. 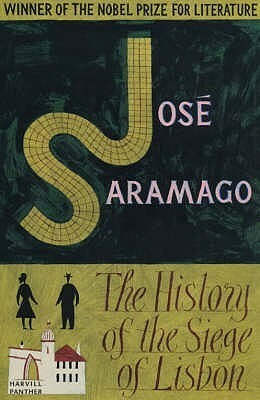 The dustjacket claims that this changes the course of history, but Saramago is not a Star Trek type sci-fi writer. Instead the book is full of the everyday angst of its undistinguished hero--"Which way should I walk to work today?" and "Should I or shouldn't I dye my hair?" for four or five pages, that kind of thing. It is a lot of fun to read, unless you happen to be going through a serious bout of angst in your own life at the moment. A leitura dos primeiros capítulos do livro foi muito difícil para mim, porque não gostei da forma da escrita: páginas inteiras sem parágrafos, com poucos pontos finais, onde as pausas existentes são na maioria das vezes assinaladas com vírgulas. Parecia que estava a ler a sebenta de Introdução ao Direito do meu 1.º ano de faculdade, que lia e voltava a reler para tentar compreender o seu conteúdo. Pelo que, a leitura tornou-se monótona e entediante e fez-me passar pelo sono algumas vezes. Acho que A leitura dos primeiros capítulos do livro foi muito difícil para mim, porque não gostei da forma da escrita: páginas inteiras sem parágrafos, com poucos pontos finais, onde as pausas existentes são na maioria das vezes assinaladas com vírgulas. Parecia que estava a ler a sebenta de Introdução ao Direito do meu 1.º ano de faculdade, que lia e voltava a reler para tentar compreender o seu conteúdo. Acho que sou uma leitora muito convencional e pouco adepta de novas formas de escrita: gosto muito de ler livros bem escritos, com a pontuação colocada no local correto. Também não gostei dos diálogos das personagens, bem como dos seus pensamentos terem sido expostos de forma descritiva. Retira emoção à história. Quanto ao conteúdo, agora sim, gostei do livro, porque contou-nos duas histórias muito originais que se entrecruzam: a história alternativa do cerco à cidade de Lisboa por parte dos exércitos de D. Afonso Henriques apoiados por poucos cruzados, porque a maioria decidiu abandonar os portugueses; e a história de um revisor de livros que decide propositadamente alterar um livro que tinha por incumbência rever, introduzindo uma modificação intencional no mesmo à revelia da editora e do autor. The story of Raimundo Silva, a proofreader, who acts on an impulse and by adding a “no” changes the content of a book and his life too. Same long phrases, same existential questions, same irony and humor between the lines. Really missed his style. Una storia d’amore reale, dei giorni nostri, che nasce e cresce parallela ad una seconda storia d’amore, questa ambientata nel passato, creata dalla fantasia del protagonista maschile della prima storia d’amore, l'amore tra il soldato Mogueime e la galiziana Ouroana, che si incontrano nel corso dell’assedio sotto le mura di Lisbona per liberare la città dai mori e restituirla al cattolico Afonso, primo re dei Portoghesi. Tre storie –le due d’amore e quella di guerra- che nascono tutte grazie ad Una storia d’amore reale, dei giorni nostri, che nasce e cresce parallela ad una seconda storia d’amore, questa ambientata nel passato, creata dalla fantasia del protagonista maschile della prima storia d’amore, l'amore tra il soldato Mogueime e la galiziana Ouroana, che si incontrano nel corso dell’assedio sotto le mura di Lisbona per liberare la città dai mori e restituirla al cattolico Afonso, primo re dei Portoghesi. Tre storie –le due d’amore e quella di guerra- che nascono tutte grazie ad una parola, una negazione, un “NON” scritto dal revisore Raimundo davanti al verbo contenuto nella frase scritta da uno storico portoghese, “I crociati avevano aiutato i portoghesi” nell’assedio di Lisbona. Una negazione che cambia la storia e la vita dei protagonisti. Saramago, intrecciando realtà e fantasia con la solita scrittura serrata, dà vita ad un romanzo -che, dice lo scrittore, “consiste nel tentativo frustrato che il passato non sia cosa perduta per sempre”- con il quale impartisce una lezione di civiltà: perché dire NO è più difficile che dire un passivo SI. للجلوس أمام طفل يحفظ كل القصص وسيقولها لك كلها في قصة واحدة ! فأنت مهيأ لبداية قصة الحصار هذه ..! كسر الاحترام الذي أوليناه لقصصنا المهيبة ،، لن يقوم به إلا عقل متمرد ،، كـعقول الاطفال التي هي على أتم الاستعداد لتقول لك وقد تصدق ماقالته ،، بأن الامير لم يعثر على صاحبة الحذاء الجميل ولم ولن يحدث ماأنت موقن به ،،! وفلسفات مذهلة يحاصرك بها ساراماجو ،، حول الحب والعزلة ،، والثقافة ،، والحروب أيضا. Come faccio a recensire un libro di Saramago? Ogni volta che termino un suo libro, non riesco mai a commentare, a descrivere le emozioni, la bellezza che questo scrittore sa regalare senza apparire banale o scontata.Ma bando alle ciance e cominciamo. Una storia nella storia che coinvolge non solo l'assedio a questa città, ma anche un correttore di bozze e decisioni che possono cambiare la sua vita. Tra fantasia e realtà, Saramago ci accompagna in un mondo in cui la storia si fa presenza e diventa Come faccio a recensire un libro di Saramago? Ogni volta che termino un suo libro, non riesco mai a commentare, a descrivere le emozioni, la bellezza che questo scrittore sa regalare senza apparire banale o scontata.Ma bando alle ciance e cominciamo. Una storia nella storia che coinvolge non solo l'assedio a questa città, ma anche un correttore di bozze e decisioni che possono cambiare la sua vita. Tra fantasia e realtà, Saramago ci accompagna in un mondo in cui la storia si fa presenza e diventa parte integrante della vita del protagonista.Un Saramago che non delude, anzi, e d'altronde come puoi deludere i tuoi lettori quando hai insito in te il DNA del genio? This book took more time than usual for me to read. The problem with Saramago's book, at least for me, is that it requires good stretches of uninterrupted attention, something which has been a sparse thing these days. But I finally finished it today. Saramago is up to his typical mischievousness here, lobbing another "what if"? The man's imagination is as boundless as his knowledge and wonder. The plot of this story hinges on a moment of whimsy on the part of a very ordinary, unwhimsical, unobtru This book took more time than usual for me to read. The problem with Saramago's book, at least for me, is that it requires good stretches of uninterrupted attention, something which has been a sparse thing these days. But I finally finished it today. Saramago is up to his typical mischievousness here, lobbing another "what if"? The man's imagination is as boundless as his knowledge and wonder. The plot of this story hinges on a moment of whimsy on the part of a very ordinary, unwhimsical, unobtrusive and unassuming proofreader for a prestigious Lisbon publishing firm. While Raimundo Silva is proofing a manuscript on The History of the Siege of Lisbon, for reasons that Raimundo is later at a loss to explain, he adds the word "not" to a sentence that had originally stated that the crusaders had agreed to help the Portuguese in their siege of the Moor-held city of Lisbon. He is forgiven his moment of indiscretion, but a new position, a manager of proofreaders, is created to prevent future problems. Dr. Maria Sara is the woman hired, Raimundo's new boss. She presents two challenges for him, one to write this alternative history he has suggested by his impulsive editing; and a second, love. As stepped, maze-like and rambling as the streets of Old Lisbon, the plot makes changes in time, verb tense and focus, which combined with Saramago's nontraditional approach to punctuation, creates a hurdy-gurdy world, which if to one's liking, is mesmerizing. Once when a friend called and wondered what I was doing, I told her "I was wasting away in Saramagoville" The author challenges our ideas of knowledge, history, historiography, human nature, language, love and the language of love. And there are the miracles; the recounting of the Miracles of St. Anthony, the Miracles of the holy knight, the miracles of love. Raimundo is very much an alter-ego for Saramago, and Raimundo's Maria Sara is Pilar, and both have alter-egos within Raimundo's story. There are times when identities, just as when standing on the balcony of Raimundo's apartment which is on the verge of Moorish Lisbon, Maria Sara askes would they have been Moors or Portuguese if it was the time of the siege. Neither is really sure. With his expansive library, Raimundo suggest they could look it up, but could the believe the answer? The last paragraph is incandescently beautiful, but the beauty would not be there unless one muddled ones way to it. To give this book a fair shot, if one is considering reading it, read it when chunks time can be devoted to it. If at first a little tiring, this book certainly makes up for its somewhat unconventional style. As fiction, the story is engaging, but it's the places the text goes in the direction of challenging the orthodoxy of historical writing that is truly memorable. The sacredness of print, the linearity of time (to say nothing of the sentence), and even the value of proofreading (in more ways than one) are all thrown out the window. This is historical fiction at its best. I am no fan of Saramago (I tried to read Blindness and it was so devastating that I don't think I made it more than 20 pages), but a novel about proofreaders! Ahh!! An entire novel by a well-respected writer about the totally weird and nichey world in which I spend all my time?? Ahhh!!! I'd previously read his excellent novel Blindness, but this was even better, both more human and more high-concept. It's a deceptively simple novel, centering around Raimundo Silva, a middle-aged proofreader in modern-day Lisbon who, when given a book called The History of the Siege of Lisbon to proof, impulsively inserts the single word "not" into a crucial sentence about the decision of a Crusader army to come to the aid of an army of Galicians besieging the city of Lisbon during the Reconquis I'd previously read his excellent novel Blindness, but this was even better, both more human and more high-concept. It's a deceptively simple novel, centering around Raimundo Silva, a middle-aged proofreader in modern-day Lisbon who, when given a book called The History of the Siege of Lisbon to proof, impulsively inserts the single word "not" into a crucial sentence about the decision of a Crusader army to come to the aid of an army of Galicians besieging the city of Lisbon during the Reconquista. When his crime is discovered, he's called into his head office and chastised, but allowed to keep his job. His new supervisor is an attractive older woman named Maria Sara who takes a liking to him and suggests that he write an alternate history exploring how the Galicians, who were the founders on the Portuguese nation, managed to get themselves into Lisbon without the help of the Crusaders. The rest of the book concentrates on the proofreader's tale, and their ensuing romance. He managed to interweave lots of stories together, the "History of the Siege of Lisbon" as narrated by the historian academic & by the proof-reader, The love story between (Raimundo Silva - Maria Sara) & (Mogueime - Ouroana). And while going back and forth between all those story lines & set of actions he managed to illustrate his other thoughts & reflections ..about names, about history and how it can be narrated, documented and even manipulated w Another Saramago Masterpiece !! He managed to interweave lots of stories together, the "History of the Siege of Lisbon" as narrated by the historian academic & by the proof-reader, The love story between (Raimundo Silva - Maria Sara) & (Mogueime - Ouroana). And while going back and forth between all those story lines & set of actions he managed to illustrate his other thoughts & reflections ..about names, about history and how it can be narrated, documented and even manipulated with! Not to forget as well his sarcastic language while discussing religious matters and ofcourse the comparison between different religions.
" The memory of that splendid night distracts Raimundo Silva, the surprise of awakening in the morning and seeing and feeling a naked body beside him, the ineffable pleasure of touching it, here, there, softly, as it were one great rose, saying to himself, Slowly, don't awaken her, let me come to know you, rose, body, flower, then those eager hands, that prolonged, insistent caress, until Maria Sara opens her eyes and smiles, when they said together, My love, and embraced". So the Siege was successful, the city was taken, the Muezzin was killed, everything was destroyed.. And even if the fictitious characters decided to run away, our main characters (Maria & Raimundo) has decided to stay, so at least love remains. A last question, was Raimundo here was reflecting Saramago himself?! I found it yes, somehow ..
La Historia del cerco de Lisboa es la novela mejor narrada que he leído de Saramago (sin demeritar las otras dos que he leído del portugués). En sus páginas, se evidencia la cadencia, sensibilidad y entrega de un escritor a su obra. En cierto modo, la novela a veces se muestra como el meta-relato de un alter ego de Saramago, sumergido en los inconvenientes y virtudes del quehacer narrativo. Diferenciándose de la labor del historiador (aquel que genera un relato con base en las fuentes y los hech La Historia del cerco de Lisboa es la novela mejor narrada que he leído de Saramago (sin demeritar las otras dos que he leído del portugués). En sus páginas, se evidencia la cadencia, sensibilidad y entrega de un escritor a su obra. En cierto modo, la novela a veces se muestra como el meta-relato de un alter ego de Saramago, sumergido en los inconvenientes y virtudes del quehacer narrativo. Diferenciándose de la labor del historiador (aquel que genera un relato con base en las fuentes y los hechos conocidos), el literato funge como creador: es Dios en la tierra de las palabras. Su historia es la vida de lo que aún no ha nacido, que nace allí, que pretende vivir para sus lectores. Para alguien como Raimundo Silva, protagonista de la historia, la creación literaria es el último (y capaz único) riesgo de una vida que no ha sabido ser experimentada...hasta esa "falla", ese impulso por borrar de un "brochazo" la historia para hacerla literatura. Para contar de nuevo sobre lo ya vivido algo que nunca ha sido vivido. História do Cerco de Portugal não era um livro de Saramago que contasse ler. Pelo menos, não para já. Mas como pretendo ler todos (ou quase todos) os livros que José Saramago escreveu e este livro era o único que ainda não tinha lido que estava disponível na livraria onde foi comprado, acabou por ser algo indiferente. Mas não estava com particular vontade de o ler, talvez pela sua temática, e a verdade é que agora penso que talvez não tenha sido a melhor das ideias. Raimundo Silva é um revisor ti História do Cerco de Portugal não era um livro de Saramago que contasse ler. Pelo menos, não para já. Mas como pretendo ler todos (ou quase todos) os livros que José Saramago escreveu e este livro era o único que ainda não tinha lido que estava disponível na livraria onde foi comprado, acabou por ser algo indiferente. Mas não estava com particular vontade de o ler, talvez pela sua temática, e a verdade é que agora penso que talvez não tenha sido a melhor das ideias. Raimundo Silva é um revisor tipográfico e encontra-se a rever uma obra de carácter histórico sobre a história do cerco de Lisboa, que foi o primeiro cerco comandado por D. Afonso Henriques. Quando chega à parte em que o autor escreveu que o exército de cruzados aceita o convite de D. Afonso Henriques para o ajudarem a conquistar Lisboa aos mouros, o revisor acrescenta um "não"; Raimundo Silva reescreve, assim, a história, passando os cruzados a não aceitarem o dito convite. Alguns dias mais tarde, o seu "erro" descoberto, uma nova funcionária da editora desafia Raimundo a escrever a sua versão da história do cerco de Lisboa, aquela em que os cruzados não ajudaram as tropas de D. Afonso Henriques a conquistar a cidade. E é assim que acompanhamos o revisor Raimundo Silva na sua missão de reescrever a história do cerco da cidade de Lisboa, enquanto vemos as mudanças que essa missão vai trazer à sua monótona vida. O início foi algo confuso e bastante aborrecido. A linguagem utilizada não é propriamente a mais corrente, o que torna a história pesada e difícil de ler. Há quem diga que a escrita de Saramago é difícil de ler, que a escassa existência de pontuação complica a leitura; para mim o difícil neste livro prendeu-se com a linguagem demasiado rebuscada que foi utilizada. Custou-me, por isso mesmo, a entrar na história. Até porque reparei que não era capaz de ler por muito tempo; uma ou duas páginas eram suficientes para me cansar. A partir do momento em que o acto de Raimundo é descoberto, a história começa a ficar mais interessante, mas, infelizmente, não o suficiente. A história de Raimundo, no tempo actual, mistura-se com a do cerco de Lisboa naquele Verão de 1147 e estamos a ler, num momento, sobre um passeio de Raimundo pela cidade, para, a seguir, sermos testemunhas dos eventos passados na mesma cidade, mas cerca de oito séculos antes. Para ser sincera, este livro irritou-me um bocado, coisa rara num livro de Saramago. Sempre achei que o autor tinha uma certa tendência para o devaneio; começa a escrever uma coisa e, porque palavra puxa palavra, quando damos por nós, já estamos a ler sobre outro assunto. Notei isto em todos os livros de Saramago que li e nunca me fez impressão, bem pelo contrário. Na História do Cerco de Lisboa fez-me revirar os olhos, suspirar, ficar impaciente. É que, neste livro, esses devaneios soaram-me a "palha", pareceu-me (e isto é a minha impressão, atenção) que estavam a encher a história. O livro tem 348 páginas e pareceu-me muito mais longo. Senti que podia ser um pouco mais curto, até porque a história que nele se conta não tem assim tanto que se lhe diga. Mais uma vez, a minha opinião. É que, bolas!, isto é a história de um homem, um revisor, que, durante a revisão final de um livro, decide acrescentar um "não" onde esse "não" não existia. É descoberto (e entre escrever o dito "não" e ser descoberto ainda acontecem algumas coisas que sinceramente não me consigo recordar) e desafiado a escrever a sua própria versão da mesma história contada no livro que reviu. Passeia por Lisboa e até se apaixona, coisa que nunca tinha acontecido na sua vidinha. E no meio disto tudo a história do cerco de Liaboa, em versão Raimundo Silva, vai-se desenrolando. Só que eu fiquei a pensar que tudo se embrulhava, tal como comida que se mastiga, e mastiga, e mastiga, mas que custa a engolir. Senti que há coisas, detalhes, que estavam a mais, fazendo com que a história avançasse a passo lento e se tornasse maçuda. Ao ponto de estar a ler e começar a pensar noutras coisas, não me conseguindo focar na história (e daí já não me lembrar de certas coisas que li). O único ponto positivo que consigo retirar desta leitura é mesmo a escrita de Saramago. Há descrições maravilhosas, diálogos inteligentes; aspectos que gosto muito quando leio livros deste autor. Mas achei a história chata no geral, talvez por não achar grande piada ao tema, e a relação de Raimundo com Maria Sara não me convenceu totalmente (embora forneça alguns dos melhores momentos deste livro), talvez por ter achado o seu começo algo abrupto. Наслідком цього "хуліганства" стала альтернативна історія облоги Лісабона, яку начебто пише наш головний герой, однак у читача складається враження, що він просто фіксує події, котрі відбуваються самі по собі. Можливо, саме так і з’являються на світ книги, яким віриш? Бо те, що розповів у своєму рукописі коректор, сприймалося мною не менш реально, як і власне його життєва історія — основна фабульна лінія роману. للوهلة الأولى للقائك كقارئ لعتبات كلمات سرماغو في قصة حصار لشبونة تتساءل، مالجديد في طرح رواية تاريخية؟ هل تُرجمت للعربية لزيادة البكاء على الأطلال أم ماذا! يدعوك المترجم- والرائع حقاً- لقوانين خاصة لقراءة هذه الرواية،حيث لا اكتراث لعلامات الترقيم ولا تحديد للمتحدثين في الحوارات، ولا فصل في الأزمنة والفقرات والفصول! عزيزي القارئ، عليك شد حزام التركيز والأنفصال تماماً عن العالم الخارجي متسلحاً ببضع نقاط "." شاغلة لكل أدوات الترقيم. بعد قبول الشروط والولوج في صفحات متحدثة عن بطل الرواية العامل في اح للوهلة الأولى للقائك كقارئ لعتبات كلمات سرماغو في قصة حصار لشبونة تتساءل، مالجديد في طرح رواية تاريخية؟ هل تُرجمت للعربية لزيادة البكاء على الأطلال أم ماذا! بعد قبول الشروط والولوج في صفحات متحدثة عن بطل الرواية العامل في احدى دور النشر البرتغالية كمصحح للكتب، والذي قرر دون اسبابٍ واضحة إضافة "لا" النافية لأحد ابرز احداث الحصار، يتبين لك بأنك في صدد قراءة روايتين في ذات الرواية. تتعدد الاحداث، وتبدأ في النصف الثاني قصة حب.. فتحيا احداث زمنين مختلفين، متنقلاً بينهما بسلاسة جميلة ومبهرة للكاتب، والمتمكن جداً من السيطرة على خيالات القارئ ليصطحبك في شوارع وحواري لشبونة حول القلعة داساً بعض الأطروحات الفلسفية في ثنايا الروح. من بين اعداء الحقيقة - القناعات - فهى اخطر من الاكاذيب .. نيتشه . هناك فرق بين - السبب - في اقتناع الانسان بفكرة ، وبين - السبب - في كون هذه الفكره صحيحة أم خاطئة ، و قد يغلب على اقتناع الانسان بفكرة ما مجرد مصدرها ، الا ان مصدر الفكرة ليس في الاغلب دليلاً على كونها حق لا ينال منه شك . الشك والارتياب في المعتقدات وضع شاق جداً للعقل البشري لا يتحمله طويلا ، ويلزمه عندئذٍ الاختيار ، فيختار ويفضل أن يخطىء على ان لا يؤمن - جان جاك روسو . و اختار رايموندو سيلفا الارتياب ، وكانت النتيجة رحلة ممتعة ومرهقة داخل عقله مع خلفية لحكايات من تاريخ البرتغال والمسلمين في اوروبا .. وكما هى عادة ساراماجو فقد كان تواجد عنصري المرأة والحب هما السند والدعم للقيام بتلك الرحلة . أكثر رواية تستغرق مني وقتًا لإنهائها، الرواية ثقيلة على العقل، كالعادة هدم لي كل الأفكار و المعتقدات. قصة حب رايموندو سيلبا و ماريا سارة أعظم قصة حب قرأتها في حياتي، و لي معها ذكريات. العلاج التقليدي لأي واحد عنده وجع في فُم المعدة بيكون مضادات حموضة، عمري ما اقتنعت بالعلاج دا، و المريض كان يشتكي بعد ما ياخد العلاج إن الوجع ما زال. كنت مندمج كالعادة مع أسلوب ساراماجو المعقد الممتع في "كل الأسماء" -مش هطول كتير في المدح و الإطراء في الرواية-، فالمهم رايموندو سيلبا -البطل- كان على وشك يتقفش متلبس في أكثر رواية تستغرق مني وقتًا لإنهائها، الرواية ثقيلة على العقل، كالعادة هدم لي كل الأفكار و المعتقدات. كنت مندمج كالعادة مع أسلوب ساراماجو المعقد الممتع في "كل الأسماء" -مش هطول كتير في المدح و الإطراء في الرواية-، فالمهم رايموندو سيلبا -البطل- كان على وشك يتقفش متلبس في سرقة، فحس بوجع في فُم معدته، فساراماجو قال إن الوجع دا طبيعي لإن المكان دا في تجمع لأعصاب بتتفرع زي الشمس و أي ضغط عصبي ممكن يخليك تحس بوجع في فُم المعدة. و لما حد يسألني على علاج لوجع فُم المعدة بقيت أديله موتينورم (دومبيردون)، و بقى يرتاح.. فحسيت إن ساراماجو ناطط في كل حاجة في حياتي.